Blondie's Cakes: Chocolate Hazelnut Tart and OhNuts! Chocolate Hazelnut Tart and OhNuts! A few weeks ago I got an email from the nice folks at OhNuts! 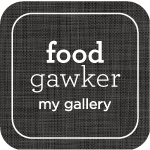 asking me if I'd like to give their products a try and maybe make something and write about it. Now, I've been placing orders with them off and on for a while now and since I love them, I said "Sure!" They have the best prices and quality for hazelnut flour I'd been able to find anywhere online, so of course I asked for that. They also carry amazing pistachios and pecans, and are quite fast and reliable when it comes to shipping, so if its not too late for your holiday baking, I would definitely recommend them. Hazelnut flour in hand, it took me all of 5 minutes to decide what to make. My coworker's birthday was going to be that Friday and as she can't have eggs, a chocolate hazelnut tart would make for the perfect treat...well, one of three, but I'll tell you more about the others later. Last year, during that glorious week between Christmas and New Years when stores discount everything and anything remotely seasonal, I got myself a cute oblong tart pan....and promptly forgot all about it. I dug the poor neglected thing out, made a really quick tart crust and caught up on holiday cards while it was cooling. These days between crazy long work hours and holiday related preparations, if I don't multitask I'll never sleep. I'm pretty sure that's true for all of you too. A quick honeyed and lightly spiced ganache got poured into the cooled crust and left on the counter to set overnight. I probably could have popped it into the fridge, but I wanted it to stay a bit on the softer side and there was time till the next day for it to set. In the morning, I slid it into an emptied Scrabble box (the only thing on hand that was the perfect shape for transport) and took it to work, where it most definitely did not disappoint. Despite someone bringing in donuts, and a giant cookie cake and various other sweets, the tart disappeared and not a single crumb remained. - In a large bowl, sift together the first two flours with salt, sugar and cocoa. Don't skip this step or you might end up with weird cocoa chunks. - Use a fork to cut in the shortening until coarse meal texture then add in hazelnut flour and vanilla and stir a few times. - Sprinkle 1/4 cup of cold water over and mix lightly. If your dough seems dry, add more water a Tablespoon at a time. Mine needed two more, but keep an eye on it. You want it to stick together but not get wet. - Dump the mixture into the bottom and sides of your tart pan, or pie pan, and chill in the freezer for 20 minutes or so. - Preheat the oven to 400F while the crust is cooling. Prick crust all over with a fork and bake for about 30 minutes. Check the tart at 20 min, you want it to look dry but not much darker then when you put it in. - While the tart is cooling, put the chocolate in a medium bowl, and combine the rest of the ingredients in a small pot set over medium high heat. - Stir the cream until the butter melts and the mixture just comes barely to a simmer, then pour it over the chocolate and let it sit for a few minutes. If you used a whole cardamom pod, pour the mixture in through a sieve to make sure the pod doesn't stay in there. - Whisk the ganache until it's nice and smooth, pour it into the tart shell and either let it set on the counter overnight or in the fridge for an hour or so before decorating with a few berries and serving. Note: The tart is pretty rich so a small slice goes a long way. 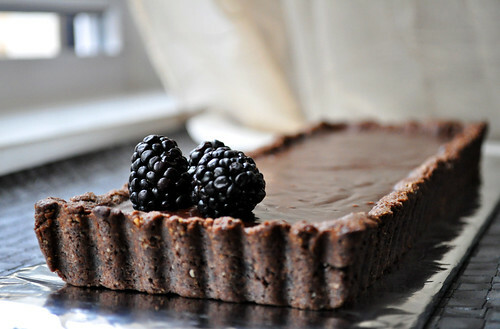 This tart looks divine! Love your pictures! Wow, this looks so incredible! 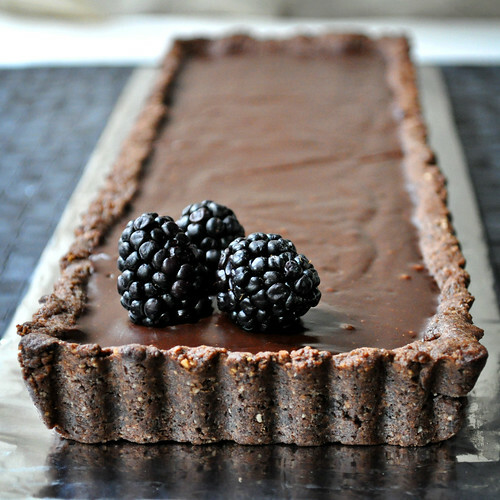 I'm such a fan of tarts..the crust on this one looks so good, and I bet it was with the hazelnut flour! This looks and sounds so delicious, Anna. Hope you had a very, very merry Christmas! holy guacamole, does that look delicious! Drool.....I am trying to figure out where you took the pic. I think I have an idea. Oh wow. This look heavenly! So rich and beautiful. 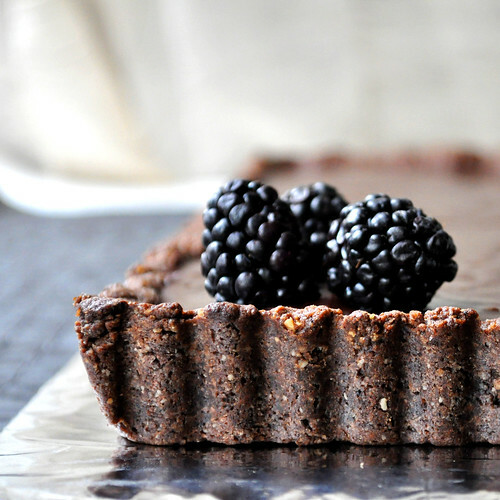 Chocolate and blackberries together sound incredible. First time here and happy to have found you. That is an absolutely beautiful tart! The recipe says "cut in the shortening until coarse meal texture then add in hazelnuts", but there are no hazelnuts listed in the ingredients?